You are here: Home / OS / Android / How to Backup data from smashed or non-responsive touch screen Android phone or tablet? I connected my phone to the computer in hope to backup all data from my phone’s internal storage. My computer did not show any drive as the phone’s screen was locked and Media Transfer Protocol was not enabled. As the screen wasn’t responsive, I couldn’t access the settings and change them, but the main board hasn’t suffered any damage and Android was running (properly!). 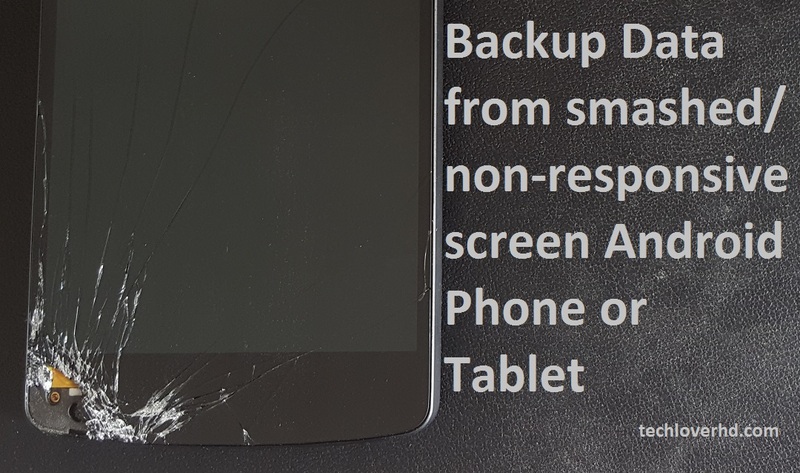 How did I backup data from my smashed screen Android phone? I thought I lost all my data. Then, suddenly, I realized that my phone has OTG support and I have a cable laying around. This should work with any Android devices either smartphone or tablet with OTG support. Make sure your phone turns on and boots to the OS. A mouse icon will appear on the screen, you can move and select with it also drag items. Unlocking the phone screen should be easy and change your settings accordingly to perform media transfer from your phone. With some Android phones or tablets you just need to connect it a computer and shows a drive in your my computer, you can backup everything from internal storage without the previous step. Hope this article helps you to backup your data from your smashed / non-responsive Android device. Don’t forget to share with your friends & subscribe for the latest posts in your inbox. Hi there Saddam. If you are using a Samsung device and it is registered to a Samsung account, you can also remotely unlock it using that account from another device. That’s proven succesful with some customers in the past.